JMRI stores various information in XML files. Although they're a text format that is basically human-readable, it's a complicated, structured format. To view an XML file that JMRI has created, just open the file with your favorite web browser. In many cases, you should be able to just double-click on it, or drag it to the web browser's icon. On some platforms, you'll need to open it from the "File" menu. If none of the browsers available to you can display the file, you can get around this problem using the JMRI mini web server in JMRI version 2.9.4 and later. Either DecoderPro or PanelPro can be used, and no layout connection is needed. You do need to be using JMRI 2.9.4 or later. The file you want to view must have been stored from JMRI 2.9.4 or later. If it's older than that, just load it into JMIR 2.9.4 or later and store it again. 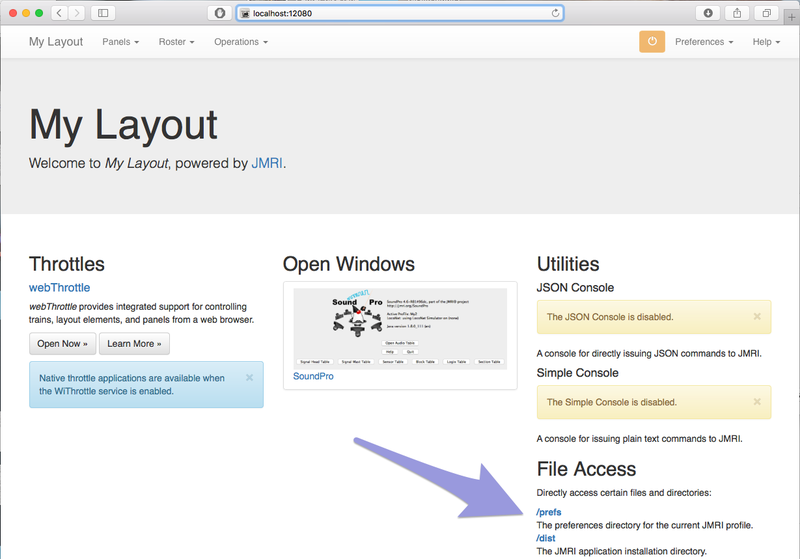 Start the JMRI Web Server: from the Tools menu, select "Start JMRI Web Server". Open your web browser and enter the URL "http://localhost:12080"
You should now see the JMRI web page for your layout, like the example below. If the XML file you wish to view is within the JMRI distribution directory, click on the "/dist" link at bottom right. If it's within the preferences directory, click on the "/prefs" link. Finally, click on any needed directory names to get to your file, then click on your file. You can then use your browser to view, print, save, etc. as desired.